It occurs to me I never posted this image. A while back I had a friend in town who is (A) an excellent photographer and (B) the only person I’ve successfully covered to driving stick. Furthermore, all the cars were running at that moment (this was days before the Disco got in a wreck and the Alfa went to try and get some repair work done), so we took some “family photos”. EDIT: Added transmission info. 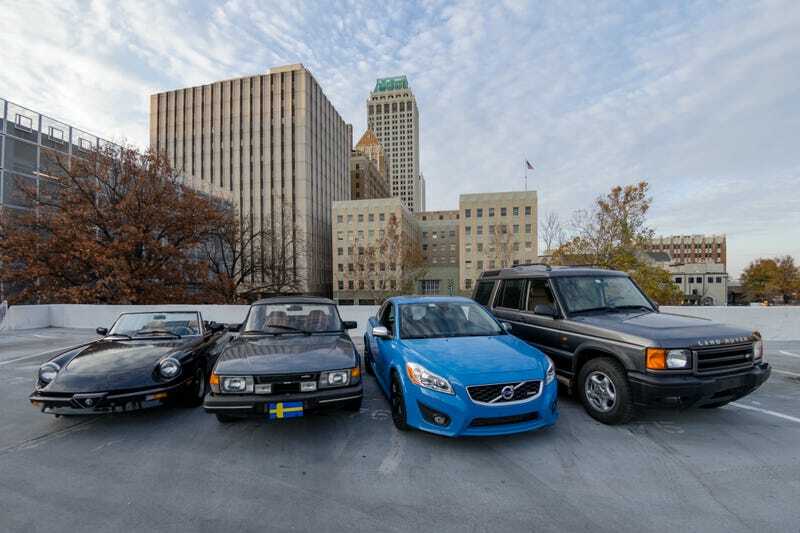 Which is to say yes, the Volvo is manual. 1987 Alfa Romeo Spider Graduate - Bought on my first “cheap car challenge road trip” and kept because it is awesome, as it turns out. Currently has some major rust that needs addressing and is a bit messy, but otherwise a great little car. 5 speed manual. Owned for 2.5 years. 1984 Saab 900 Turbo Sedan - Given to me as my first car in 2002 after my brother didn’t want it anymore. Sent to the mechanic for a broken starter in 2004 and didn’t return until July of 2016 when I somewhat forcefully took it back from the mechanic. Spent approximately 1.5 years to get running again and currently runs and drives mostly OK. 5-speed manual. Owned for 15.5 years or 4.6 years, depending on how you look at it. 2013 Volvo C30 Polestar Limited Edition - I traded my 2009 Civic Si for this Volvo when I decided I was tired of driving a “reliable” car that wasn’t particularly interesting. Good car and surprisingly quick. Just out of warranty last month, which is scary. 6-speed manual. Owned for 5.1 years. 2001 Land Rover Discovery II SE7 - Bought during my second “cheap car challenge road trip” and kept because I am apparently into abusive (car) relationships. Recently was backed into by a neighbor and has blown head gaskets. 4-speed automatic. Owned for 0.7 years. The Renegade also helped out ferrying drivers to and from the shoot location and acting as a photographer stand. Thank you to Taylor for all the awesome photos. Also they are his, so please ask before any reuse.